but to keep it simple, all I can say is that it works!" Version 6.5 SR5 is built upon the same solid database, features, functions and customization tools that thousands of AutoEDMS users have relied on since it was first released over twenty years ago.. AutoEDMS Version 6.5 SR5 has been enhanced with many new features, new functions and overall improvements. AutoEDMS manages your engineering data and documents with a flexible and powerful, multi-user database that can manage millions of files. The AutoEDMS database gives you a central and secure reference to all of your files, for easy search and retrieval. AutoEDMS includes the AutoEDMS Navigator. The Navigator is an Explorer-style database navigation and file selection tool. The Navigator is implemented throughout AutoEDMS and can be used in any situation where you would like to "navigate" the database in order to build a "collection" of chosen files. Examples include batch file check-out/check-in, automated transmittals, and batch printing and copying. AutoEDMS automates document revision and approval processes with the built-in AutoEDMS Workflow Engine. You can use the drag & drop "Visual Workflow Designer" to establish multiple workflow processes. These workflow processes can automatically route your documents between people and departments, through a multi-step revision and approval process. Version 6.5 SR5 offers significant performance improvements in workflow operation, particularly for workflows with multiple steps and several documents. The Workflow Engine now effectively handles routes with missing files and also better handles routed records that don't have any associated files attached. AutoEDMS provides easy management of your engineering documents, through secure check-out and check-in. These functions act as an electronic librarian, instantly monitoring who has files checked-out of the system and when they are checked back into the system. This prevents two people from working on the same file simultaneously. Users can have multiple documents checked-out in their AutoEDMS "In Basket" to secure them while they are being edited. AutoEDMS has a built-in, flexible filenaming system that you can use to automatically name (or number) your documents. This helps you concentrate on your work, and not on cryptic filenames. AutoEDMS will also process "drag & drop" files and update or insert them into your AutoEDMS database. This is a simple way to import existing files into AutoEDMS. AutoEDMS and the Workflow Engine will help you track multiple revisions of your documents, and roll-back older versions to make room for the new ones. AutoEDMS manages all revision transactions with a workflow history database, with complete error checking and automated recovery. looking for, including "FastFind" searches directly from the AutoEDMS toolbar. AutoEDMS' built-in security works on top of existing network security restrictions. AutoEDMS security prevents unauthorized access to files, database Forms, database information and programs. AutoEDMS supports Windows "hidden shares" and secure read-only directories to prevent unauthorized file access or updates. AutoEDMS includes a built-in AutoEDMS Reports solution. AE Reports includes a visual report designer. It supports picture/image field types to display company logos, project database fields can be added to reports, the report orientation (portrait/landscape) is saved with each report definition and the print preview function has been improved. Version 6.5 SR5 includes an improvement in AE Reports to better fill each report page with the selected data. AutoEDMS AVDE is state-of-the-art viewing technology that directly views and prints hundreds of file types, including AutoCAD DWG and DWF, MicroStation, Acrobat PDF, and Word/Excel. AutoEDMS provides secure, read-only viewing and printing of your computer-based assets. AVDE is setup as a shared Windows application and its licenses "float", just like AutoEDMS. Version 6.5 SR5's AVDE system has been upgraded to support the latest file formats, including AutoCAD 2010, MicroStation 8i and Microsoft Office 2007. SR5 also supports an "HD AutoImage" option that provides "high definition" autoimages for TIFF files, etc. The AutoEDMS "Database Transfer" Wizard has been dramatically improved to aid in the importation of other databases via Microsoft Excel. Spreadsheet columns can be mapped to AutoEDMS database fields, in addition to default values for other fields. AutoEDMS supports spreadsheets with multiple sheets and database transfer "mapping" settings are retained throughout the import process, so they can be modified without recreating them. Project database fields can also be included in the transfer process. Version 6.5 SR5 is fully compatible with Windows Terminal Server and Citrix MetaFrame. It can be easily deployed over the Internet to efficiently support remote AutoEDMS users. AutoEDMS has an optional Redline Module that offers drawing markup and redlining. The Redline Module is tightly integrated with AutoEDMS and the Workflow Engine to provide managed and secure annotation of CAD drawings and scanned images. You can configure AutoEDMS' AutoTitle Block System to automatically keep your AutoCAD titleblock attributes "in sync" with your AutoEDMS database information. AutoEDMS includes a configurable titleblock database that you can setup to match your AutoCAD titleblock layouts. Version 6.5 SR5 has been enhanced to support AutoCAD 2010 attributed titleblocks. With the Extension Association system, you can configure the same file-type any number of times. This enables AutoEDMS to correctly load different application configurations, depending on your requirements. For example, an AutoCAD drawing file (with an extension of DWG) could be loaded by a variety of AutoCAD configurations and 3rd party add-ons. AutoEDMS provides email support to notify colleagues of new document revisions, project status, or just send a file directly from your AutoEDMS screen. Corporate email systems, including Microsoft Outlook, Outlook Express and Lotus Notes are supported. You can further customize AutoEDMS' out-of-the-box features and functions with the built-in AutoEDMS customization tools. the QwikForm program is used to design the graphical database screens (Forms) and databases. Use the Visual Workflow Designer to create automated document workflow procedures. AutoEDMS also includes the powerful ACS Customization Language (ACL) that you can use to quickly implement your company-specific engineering document management functions. Version 6.5 SR5 supports additional ACL commands. AutoEDMS includes System Administrator utilities for User / Workstation registration and system maintenance. Uilities have been added to make implementation easier for larger installations, including an improved "Maintenance Mode". All Administration and Configuration programs can be accessed from the AutoEDMS program group as well as from the AE InfoCenter. AutoEDMS stores the AUTOEDMS.INI file and other key settings in areas are the workstation that are not usually "locked down" by IT controls. AutoEDMS can automatically update itself with program enhancements or changes from a secure ACS web site. Complete error checking is built-in, and you can review the downloaded files before updating your production AutoEDMS system. 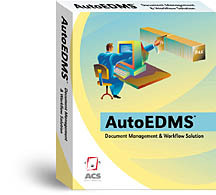 All AutoEDMS documentation is published online for easy viewing and printing. AutoEDMS' documentation is stored in the Microsoft HTML-based Help format which offers easy and familiar text navigation and selection. If you would like to receive upgrade information on Version 6.5 SR5, please call or email us. Thanks!